Grumman F6F Hellcats of Navy Squadron VF-19 from the aircraft carrier USS Lexington, during a mission on November 6, 1944 over the island of Luzon in the Philippines. 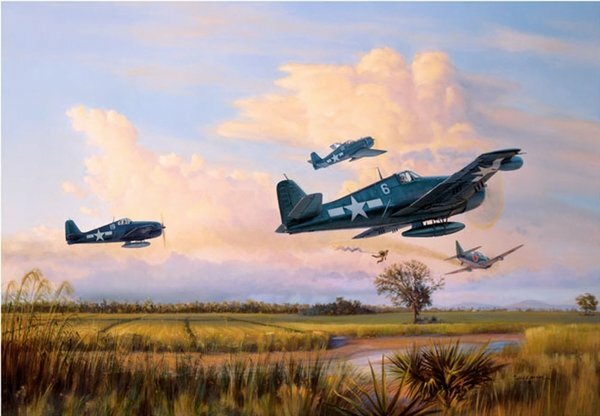 Elvin "Lin" Lindsay and Albert Seckel successfully downed a Japanese Kawanishi N1K1-J "George" fighter after a long, low level chase over the sugar cane fields south of Clark Field. The Japanese pilot, already wounded and probably realizing he had no chance for survival, bailed out too low and struck one of the only trees in the field. Image Size: 11-½" x 21"
Image Sise: $22" x 33"